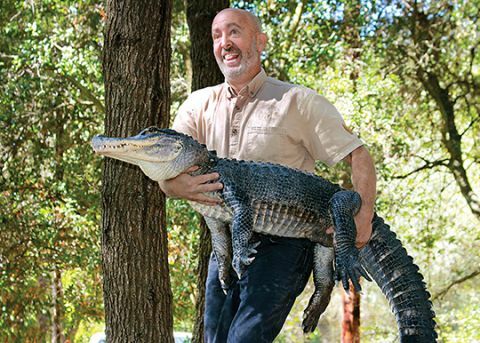 Alligator Izard proved an arresting armful for wildlife expert Gabe Kerschner during the NatureFest event at Effie Yeaw Nature Center. The 103-pound reptile showed an inner pussycat and allowed scores of kids – including Roseville Cub Scout Logan Winkler – to pet his scaly hide. CARMICHAEL, CA (MPG) - Raptors, reptiles, marsupials and mammals were among educators featured at the Effie Yeaw Nature Center’s recent NatureFest. Beneath fall skies and autumn leaves, more than 1500 visitors supported the annual festival. Programs aim to encourage wildlife appreciation through education. Save the Snakes – a non-profit that champions one of nature’s most misunderstood species, offered a program designed to dispel many myths. Gopher and king snakes slithered into the spotlight as living exhibits. Among other presenters, wildlife expert Gabe Kerschner brought an exotic cast from Wild Things, his Placer County animal sanctuary. All rescued from adversity, his animals are stars of hundreds of television and school programs. Those who made the Carmichael journey included alligator Izard, a lemur called Ringo, Opie the opossum, iguana Linguini and kinkajou Nike. Kerschner’s commentary outlined heartbreaking animal rescues. Six-foot Izard was pulled from a Los Angeles apartment bathtub and now thrives at the Colfax wildlife preserve on fish supplied by Nimbus Fish Hatchery. One of an endangered species, lemur Ringo barely survived an illegal smuggling operation and – 24 year later – the petite primate is one of Kerschner’s most popular ambassadors. Resident Nature Center raptors also interacted with visitors. Shell crafts and animal track recognition were among many activities offered for children. As the facility is also a center for Native American studies, Maidu basketry was demonstrated in the replica native village. Learn more about Effie Yeaw programs at www.sacnaturecenter.net.